Have you ever experienced a similar situation: you hear an intriguing story on radio, your spouse shares a convoluted story about her co-worker, a tour guide shares captivating details about a famous memorial – and later, when you attempt to share these stories with someone else, you discover you’ve forgotten most of the details? You can’t recall the name of the writer you heard on the radio, you aren’t sure if your spouse’s co-worker went to Portugal or Poland, and you don’t remember if the memorial was built after World War II or before the Korean War. Developing personal connections and participating in conversations rely on your ability to remember these kinds of details. Successfully engaging in gratifying relationships is aided by your ability to remember the details of what you heard. The examples of how this type of memory improves people skills are endless. It can accomplish everything from selecting the ideal gift for a family member based on what he told you his interests were to following up on an important event in a friend’s life to recalling why your co-worker needed your assistance. Our In the Know exercise is designed to directly target your memory for auditory details like the examples shared above. 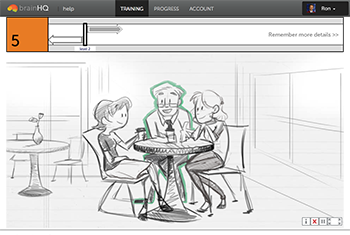 This exercise extends memory demands by encompassing common real-world situations like complex conversational narratives and builds on top of other listening exercises provided by BrainHQ such as Syllable Stacks, To-Do List Training and Memory Grid. During our In the Know exercise you must sharply focus your listening and accurately record the details in memory of longer and longer narratives that grow increasingly difficult with elusive details. This exercise represents your brain’s last step toward establishing an accurate and robust sound reception system. Eventually the speech processing will speed up and become faster than regular speech. The complexity of sentences will increase by containing more information. There will be shorter breaks between sentences. More sentences will be added.